VOSH-CT was founded in 2001 by Dr. Matthew Blondin & his wife, Attorney Audrey Blondin. 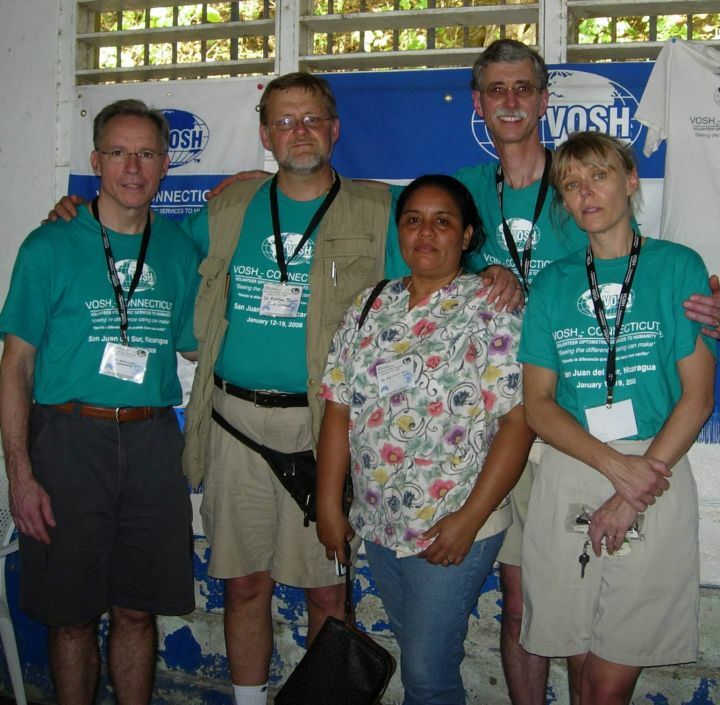 Members of VOSH/Connecticut and support staff run a yearly eye clinic in San Juan del Sur, Nicaragua providing eye care to those in need. During the past three decades VOSH has evolved into a dynamic nonprofit, volunteer organization dedicated to the preservation of human sight, mainly in developing countries where there is no welfare. VOSH also serves as a resource for other organizations with similar goals. The VOSH concept was founded by a Kansas optometrist, Dr. Franklin Harms,in 1972. Currently VOSH/Connecticut is one of 24 nonprofit chapters that are coordinated by the parent organization, VOSH/INTERNATIONAL, whose duty is to keep abreast of chapter activities throughout the United States, including student volunteer groups. How much VOSH/Connecticut can accomplish is directly related to the funds in hand. While each participant pays his/her own expenses, other costs cannot be ignored: examining equipment, reading glasses, medications, shipping, mailing, to name a few. Generally, VOSHERS pay their own way and often give up vacation time to participate. While some VOSH eye care missions may be carried out by a single dedicated professional working alone, more frequently services are carried out by a team that may include eye professionals, physicians, nurses, physical therapists, dentists, assistants and lay people. A local service group from the host country (often a Lion’s Club or a Rotary group) facilitates organization and arrangements at the other end. The team will send ahead thousands of pairs of used glasses that have been carefully sorted, cleaned, labeled and cataloged in order to fill prescriptions. While a considerable amount of this work is done by VOSHERS themselves, Lions Clubs throughout America have been a major resource for recycled glasses. Depending on the size of the team, VOSHERS will examine hundreds, sometimes thousands of patients over a four- to six-day period. In many cases this will be the first, and sometimes the only examination patients will ever have in their lifetime. A long with prescribing and dispensing glasses, optometrists will identify patients who require further treatment for glaucoma, cataracts, pterygia, diabetes and other medical conditions. Clinics may include an eye surgical team or, sometimes a surgical team will conduct a follow-up clinic shortly thereafter. VOSHERS do make an effort to assure follow-up for acute cases, but the larger burden for such care remains with the host country. Your membership in VOSH/Connecticut or your financial contribution will enable us to purchase better equipment, continue our present projects and plan future projects to still other areas where the need for eye care is presently not available. How can you assist VOSH/Connecticut? Sign up for a VOSH/Connecticut mission. Become a member of VOSH Member.